Set in the heart of Dallas Market Center, this hotel is conveniently located to many popular Dallas attractions. Guests can have free made-to-order breakfast and dine at the Atrio Restaurant and Bar for some delicious Texas cuisine. The hotel features an indoor swimming pool and fitness center. After a long day of exploring, guests can unwind in the spacious guestrooms and suites that feature modern amenities. 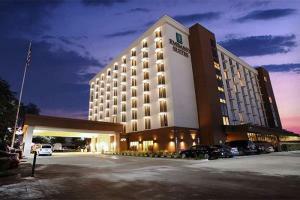 Located about 15 miles from Dallas/Fort Worth International Airport and about 4 miles from the Convention Center.